Quick Review: On the heels of a family tragedy, the last thing Katie Greene wants to do is move halfway across the world. Stuck with her aunt in Shizuoka, Japan, Katie feels lost. Alone. She doesn’t know the language, she can barely hold a pair of chopsticks, and she can’t seem to get the hang of taking her shoes off whenever she enters a building. Then there’s gorgeous but aloof Tomohiro, star of the school’s kendo team. How did he really get the scar on his arm? Katie isn’t prepared for the answer. But when she sees the things he draws start moving, there’s no denying the truth: Tomo has a connection to the ancient gods of Japan, and being near Katie is causing his abilities to spiral out of control. If the wrong people notice, they'll both be targets. Katie never wanted to move to Japan—now she may not make it out of the country alive. 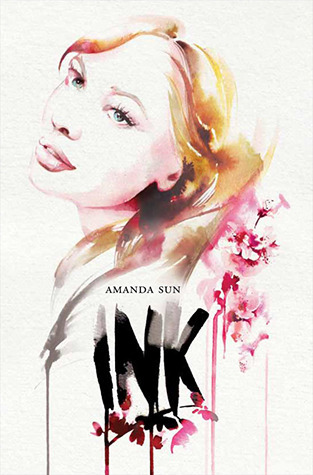 Detailed Review: I felt so amazed and awed after reading Ink. It felt like I was on a roller-coaster ride the whole time with it's own set of slopes and loop-the-loops. It was so exhilarating the whole time I was reading the book. What I loved most about the book was it's setting. It's actually the first time I read a book set somewhere in Japan and I wondered if this would influence the fact on how much I would like the book. True, it did feel foreign at first with all the Japanese words and background but then you'll get used to it and move along with the flow. I love books like this. Also the characters had depth, which always contributes to the amazingness level of the book. Katie is forced to go to a place where she's considered a foreigner but she is brave enough to face the difficulties and also uncover Tomohiro's true facade. Tomohiro is selfless as he tries to keep his ex-girlfriend and Katie away so his powers won't harm the people his love and yet he needs them more than they need him. I think these two main characters will be hard to forget in a long time. The story also took my breath away, because of it's complex simplicity, since all the author did was took a key idea and story and developed it into something more. This book was a new experience, with it's setting, characters, culture and events and I also really like Amanda's ability to involve both the mythological and fantasy world together with our world. She relates them together so well. Her debut novel will certainly win lots of hearts, not excluding mine. AND I THANK THE PERSON WHO DESIGNED THE COVER AND DID THE SKETCHES IN THE BOOK. THEY'RE BEAUTIFUL. I loved the art. They're just so miraculously perfect. Brief Review: Against a beautiful and cultural setting, Amanda Sun creates a story that exudes originality and creativity. And the characters are ones that wouldn't be easily forgotten. The author manages to weave in reality and the fantasy world so well into Katie's life that you would find yourself amazed by the skills wielded by the author. I believe that the author herself did the designs. They truly are amazing. This book was in the middle for me. I really disliked the ending. To me it felt like she made that choice to force a sequel. I'll probably still read the sequel though. One Week Blogoversary Giveaway: DAY TWO!!! !